This is the first of two posts for Mother’s Day cards that I want to share with you. I had to wait to post them because I didn’t want the recipients to see them before Mother’s Day. I colored plain vellum using a technique I learned from Jennifer McGuire in the Online Card Class: Clear and Sheer. It’s a great class and I recommend it to anyone who wants to learn how to get more creative mileage from vellum. I started with an A2-sized piece of vellum. Three different shades of pink were used to color the vellum to create a very subtle ombre effect. I started with the lightest color on the bottom and gradually worked up to the darker pink that you see on top. After coloring the vellum and making sure it was dry, I used a floral stamp from WPlus9 (Ranunculus) and stamped it twice onto the vellum (upper right corner and then lower left corner) positioning the stamp a little differently each time with Versamark ink. The floral images were then heat embossed in white. 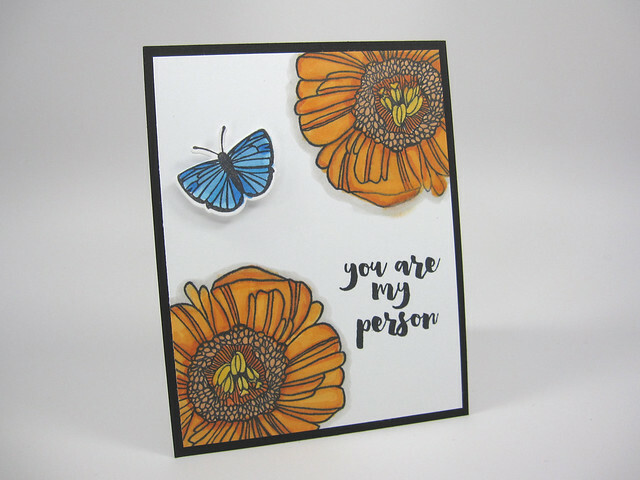 The sentiment strip was die-cut from a stitched strip die from My Favorite Things and then stamped with a Mother’s Day sentiment with Versamark ink and heat embossed in gold. The strip was glued to the vellum and used to hide the adhesive need to attach the vellum piece to the card front. One of the many tricks I learned in the Clear and Sheer card class. One thing to note is that I had to cut both ends of the strip because it was a little too long for the width of the card. 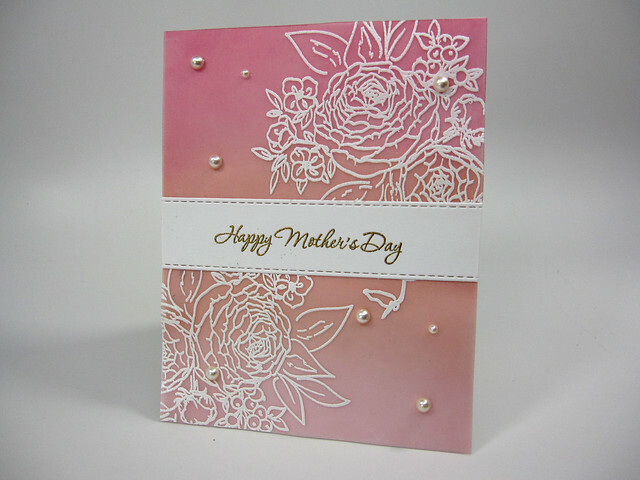 Pearl embellishments in 2 sizes were added to complete the card. I love the soft, feminine look of this card. 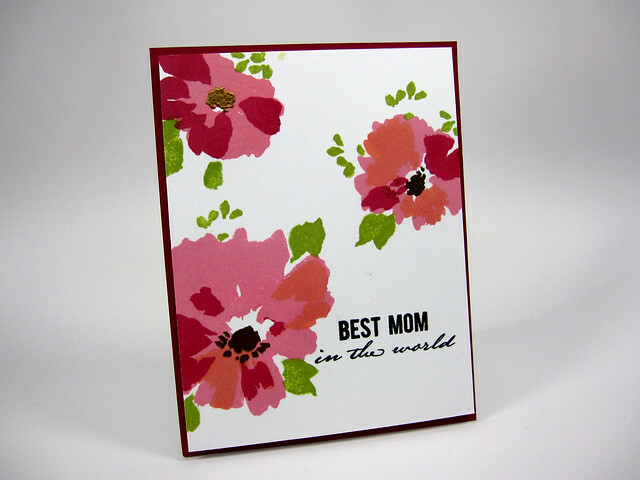 Stamps: WPlus9: Beautiful Bouquet: Ranunculus (flowers); Papertrey Ink: Keep It Simple: Mother Mini stamp set (sentiment). Inks: For background from lightest to darkest: WPlus9: Little Piggy, WPlus9: Sweet Nectar, Hero Arts: Bubble Gum shadow ink; Versamark Ink. Dies: My Favorite Things: Horizontal Stitched Strips (die with the smallest width). Cardstock: Bazzill Vellum 40#; Neenah Solar White 80# for sentiment strip; Neenah Solar White 110# for card base. Other: Hero Arts white embossing powder; Hero Arts large and small pearls.